I decided to write this free ebook because teachers often ask me for ideas about how to use and store task cards – or even why they should use them at all. There are bunches of answers to all these questions, so I thought it would be a good idea to put them all in one place. If you are new to task cards, this ebook will tell you everything you need to know. You will also find links to free sets of task cards, so you can try before you buy. If you already use task cards, then you are sure to find a some new ideas – there are quite a few! 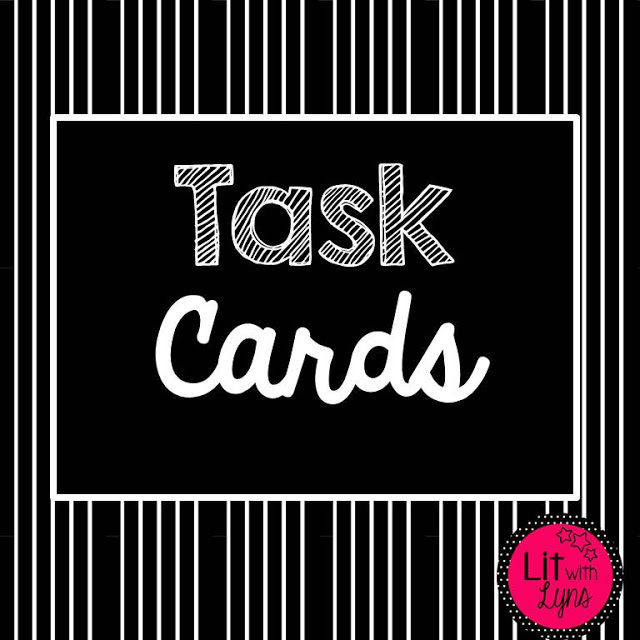 What an amazing resource for anyone who wants to know how to use task cards! Thanks! What an amazingly thorough look at task cards! You have thought of everything here. Thank you so much for sharing your expertise with the world. This is absolutely the most thorough explanation of task cards that I’ve ever seen. 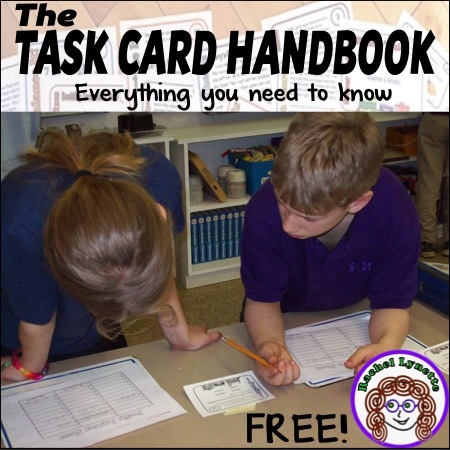 Anyone who has ever used task cards will find new ways to use them in this handbook. Teachers who have never used task cards will be able to do so with confidence after reading this handbook. And people who are trying to develop their own task cards will get clear practical advice on what to do and what to avoid. This is an absolutely essential product regardless of your level of experience with task cards. I’ve been using task cards for years, but this gave me several more ideas on how to use them, and some great ideas for organizing them! Thanks! It is totally free, so why not download it now? I would also be thrilled if you would share it with your friends and colleagues, both online and off. It makes a terrific pin! I would love to hear how YOU use task cards with your students. Please share your thoughts and ideas. Rachel, this resource is great! I have lots and lots of your task cards. My students love them. They are great for reinforcement, small groups and especially review! Thanks for the "surprise" too. One way I like to use them is for partner review. I have several of those popper pals and we use the task cards to answer the questions. If answered correctly, the player gets to squeeze the popper and try to get the ball in a basket. They can earn a point for a correct answer and a bonus point for getting in the basket. It's hard to pry them away from this activity! Thanks for creating such a great resource and thanks for making it free! I love sharing with other teachers how effective task cards can be in the classroom and how much fun they make learning.